Let's look at what I had two years ago. I love the light in this picture. It was the party we made for my mom's birthday and there was snow outside. I would still LOVE a pair of Koos shoes. Know anyone in Amsterdam who can send me a pair? Lovely. A mystery as I have no idea where I lifted it from. Apparently I enjoy looking at shoes in March. Every year. I've done both this past week. Would I have fashion critique for Ann Hathaway this year? Why did I upload photos of strollers? BECAUSE I LOVE THEM...and, also, because two years ago, I cleaned and disassembled my babies stroller and stored it away. I was looking for a picture of it. This Spring I am delighted to be attending a baby shower for my cousin at which I hope to gaze upon lots of good baby loot. Their baby is due in May and I'm off to celebrate in a couple of weeks. What did I write about two years ago? Survivor and school and my favorite song. I'm kinda getting freaked out about how I remember you blogging those things back then. Not.a.stalker. Even when you've "got nothing" to post, I enjoy reading your blogs! That chalkboard is outstanding! As are the Koos, I have never heard of them! I have had so many strollers the last 2 1/2 years, and none that I like. That one looks good! I love the medicine cabinet. I think EVERYONE should post a photo of their medicine cabinet. I remember the wedding photos - I still thought you really were in Tuvalu and was so amazed at the development of the place - didn't they know they'd soon be under water?! I parted with my last stroller 2 years ago at Christmas. Tears were shed. Thanks for the memories. I am re-lusting after that stroller. And those shoes. OMG, 3 years have gone by already? A May baby. Like me and someone else I know (wink). I'm pleased to report that our medicine shelf is really clean these days--I had days of purging over the long winter. Your party table DID look so lovely. I know it's something my mother would say, but is Ann Hathaway wearing a dress made out of a curtain? I just got all teary at your cousin's wedding, again. Love, love that she wore her mom's wedding outfit. And it looked simply smashing, too. I wasn't reading Say La Vee back then but I did enjoy visiting your cousin's wedding today. Congrats to them! You will let us know the news won't you? Outer Tuvalu has practically come to a stop now that we know there's a new blackbirder in the wings. oh and prepare yourself for blatant idea theft. 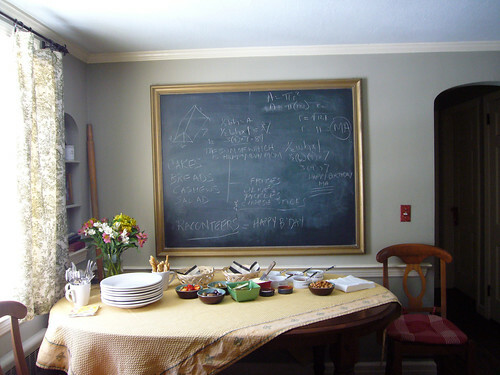 That framed blackboard in the dining room is a stroke of genius. Now I just need to figure out if I trust my brothers-in-law not to leave crude drawings and messages on it.